Teachers doing “Balanced Literacy” programs often think they are doing a lot of phonics, and we should all get off their case. One academic commented recently that this is probably because nobody has ever given them an opportunity to see or use a proper synthetic phonics program. Getting an opportunity to show busy early years teachers a program like this is tricky, and the information is much better coming from a fellow teacher than a speech pathologist like me. The Get Reading Right free webinars for teachers have thus been great, but they’ve run at a specific time, and you’ve had to sign in, which has probably limited their audience. However, I’ve just realised that GRR (top marks for acronyms!) 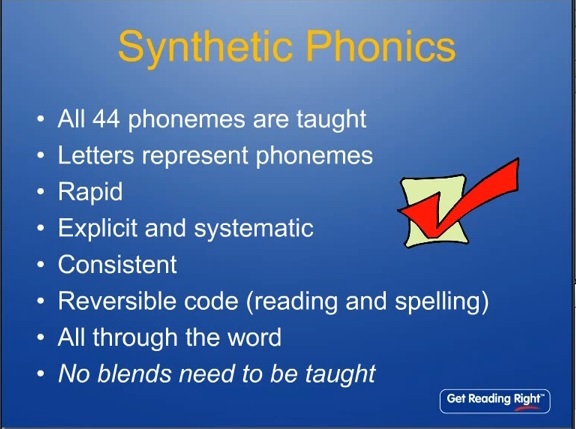 has put a recent webinar containing an overview of synthetic phonics, with examples from their program, on YouTube. Anyone can watch it any time, without any logging in. This entry was posted in phonics activities, sound-letter links, sounds, spellings, teaching strategies on February 23, 2015 by alison. Ah yes, sorry about that, the post you were looking at is nearly two years old and GRR must have taken that video down. They do still have a few videos online, see https://www.youtube.com/channel/UCSYp34VP77D2_KMoMXZhILA. Plus they still run webinars, see http://www.getreadingright.com.au/free-teachers-webinars.